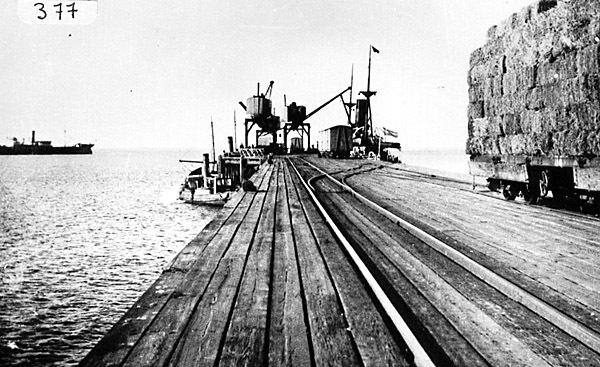 This was built of wood and carried a single rail track. The muelle as seen from the shore. The cart with the barrel to the right belongs to an aguatero, a drinking water vendor. A view from a similar angle, but unusually showing one of the 0-4-2s at the extreme left. A view looking towards the shore. Another view in the same direction. 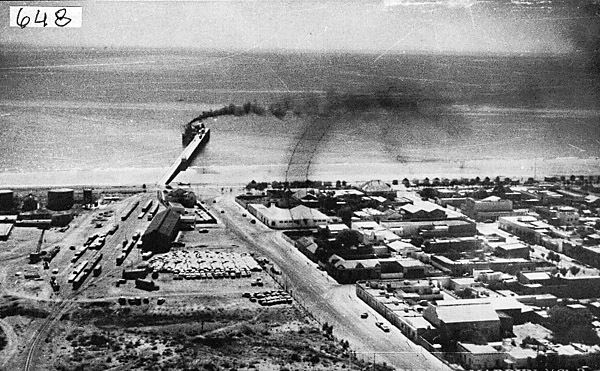 The photo below was taken from the north, and shows a 2-6-0 with a train of mainly 4-wheeled wagons out on the wooden jetty. 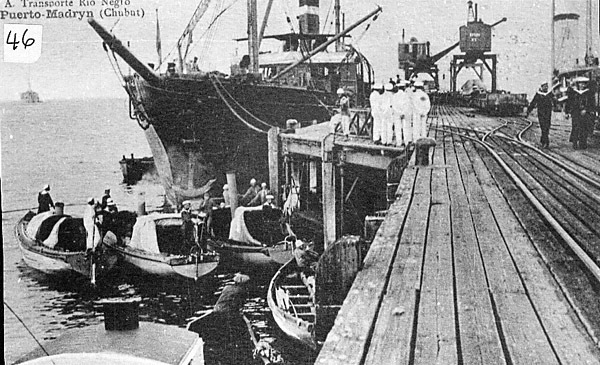 2 The new muelle completed in 1910. 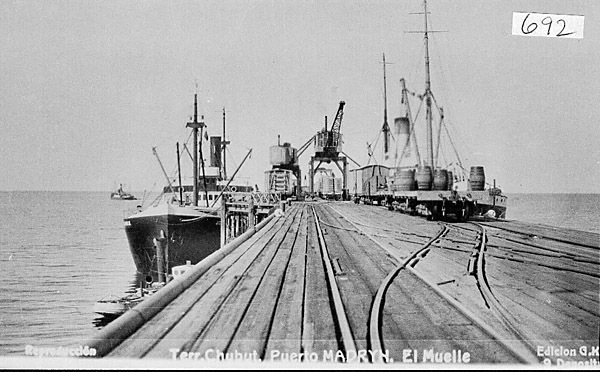 The replacement muelle carried double track along its length, with a wider section and more tracks at the far end. 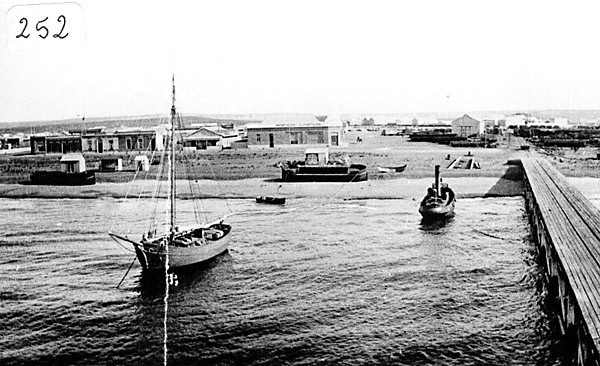 It was slightly further south than the original muelle, which seems to have been demolished. 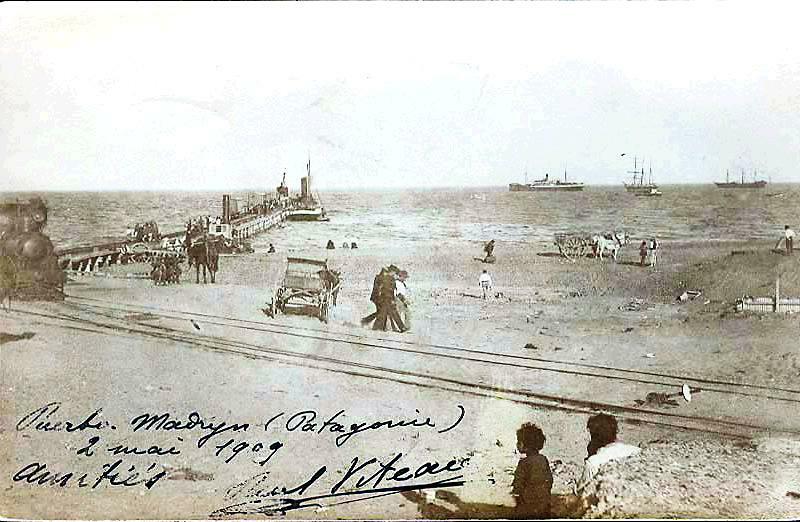 A view from the beach showing the much increased length, and with a 2-6-0 hauling a line of plataformas. At the seaward end there was a scissors crossover, and then the two main tracks each divided, the two inner forks joining together, thus creating three sidings in total. 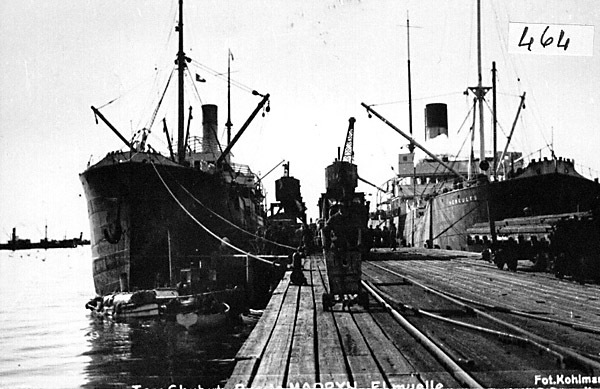 This photo shows this later arrangement, at an early date judging by the ship on the left. A much later view showing a pair of flats on the left-most of the three terminal sidings. The double crossover is clearly visible in this shot. The tail of a crossover is visible here. 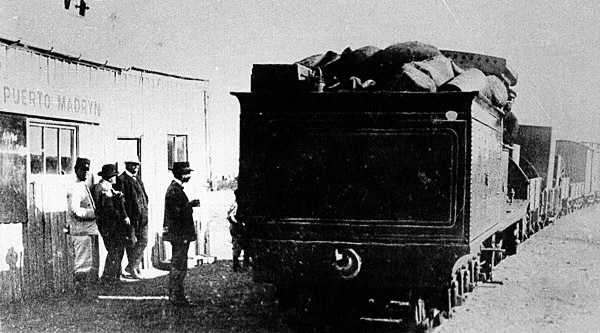 Another view showing the crossovers, with a well-laden wagon of bales on the right. An aerial view of the new muelle, A substantial yard is visible at the landward end of the jetty. 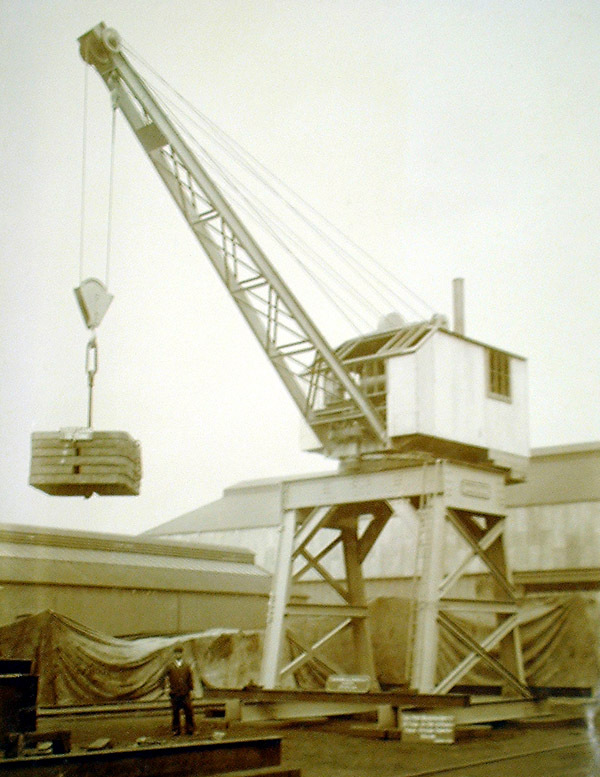 Travelling cranes built by Ransomes & Rapier of Ipswich, England, for the new steel muelle at Puerto Madryn. Three of these machines were supplied, two initially, and an extra one later on. Pictures from the R&R archives by courtesy of Suffolk County Record Office. 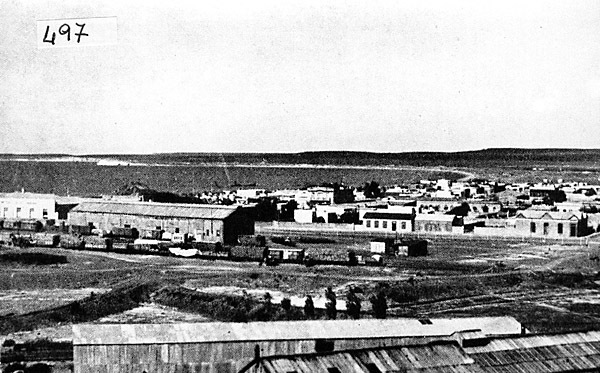 An early postcard looking out over Puerto Madryn and with a 2-6-0 prominent in the middle distance. 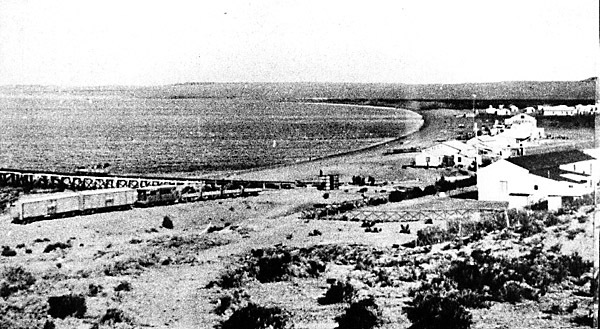 3 The first Puerto Madryn station. 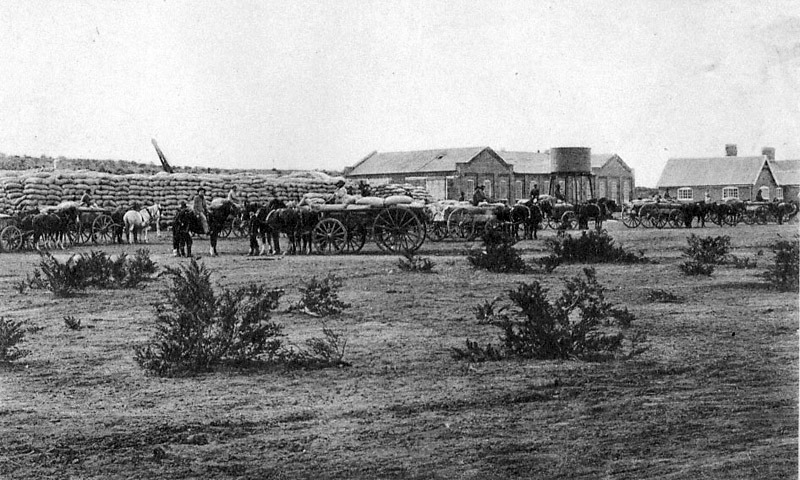 The early station building was a simple currugated iron structure. 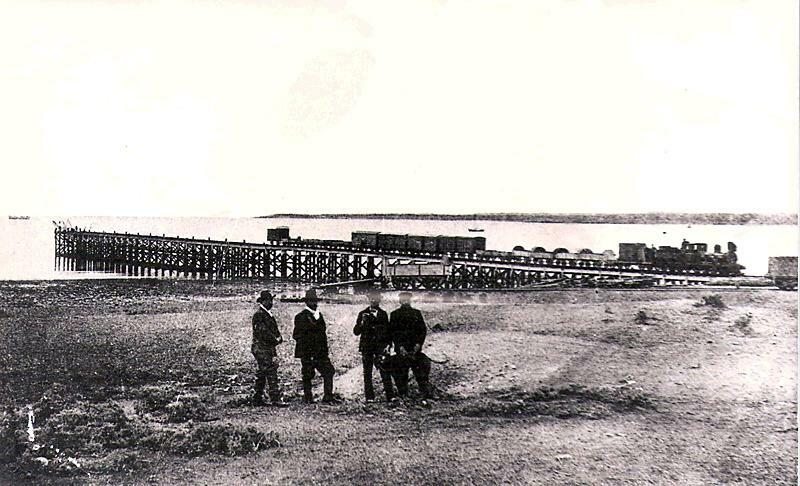 Two bogie vans, a Bolling & Lowe coach, and four four-wheeled wagons stand on a siding to the north of the muelle. 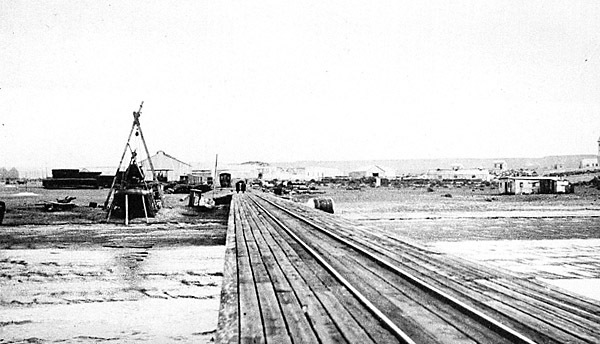 A line of vans stands on the siding north of the muelle. The town has changed almost out of all recognition, but one building is still there. It is the one on the left corner of the street in the background with the pointed bit above the third window from the right. 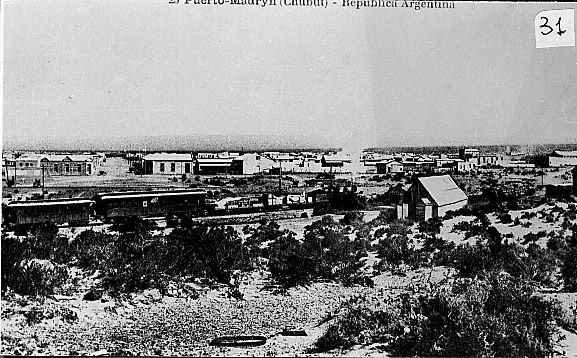 In those days it was the Chubut Mercantil Company's building, it is now a dive centre and the building is listed. 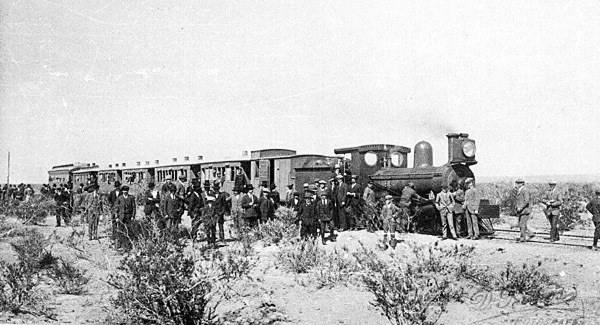 One of the 2-6-0s has arrived at Puerto Madryn station tender first. 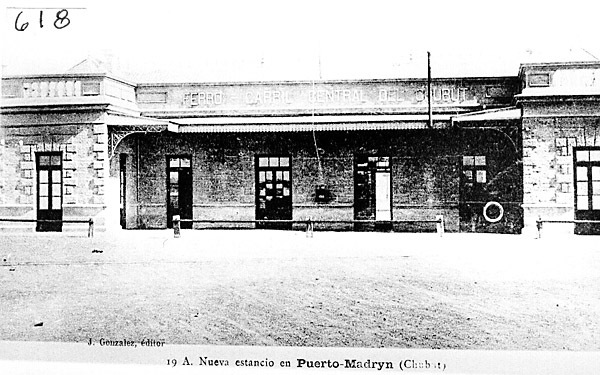 4 Puerto Madryn station after its reconstruction. The new station building, constructed after the takeover of the company in 1906, was a much more substantial building, of stone, and with a canopy over the platform. The town side of the new station. Two coaches stand in the platform, and a pair of bogie low-sided wagons. 5 Other views at Pto. 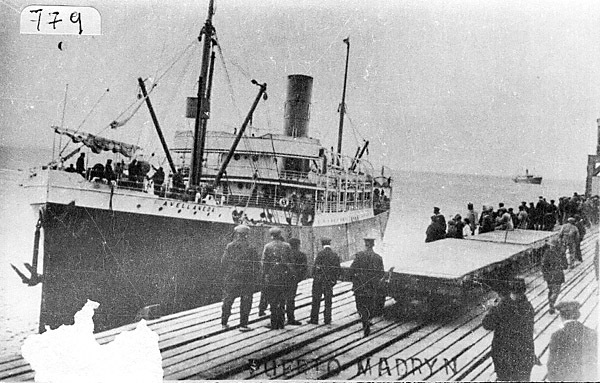 Madryn. Beyer, Peacock 2-6-0 no. 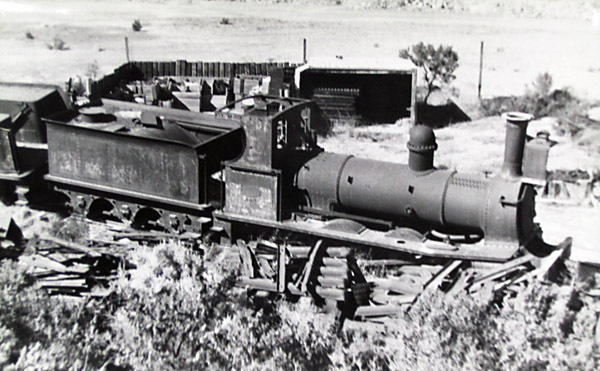 3 lies derelict at an unknown date, and an additional tender is off to the left. The loco survives to this day, preserved at the old Pto. 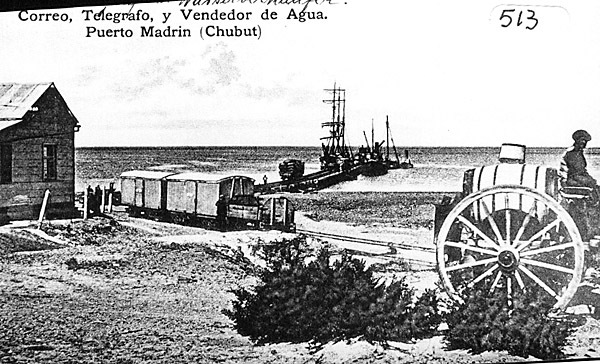 Madryn station. 6 Further up the line. A train made up of a birdcage brakevan, the original clerestory coach, two of the smaller coaches, another birdcage brake, an and a plataforma carrying wool bales, hauled by one of the later 2-6-0s. 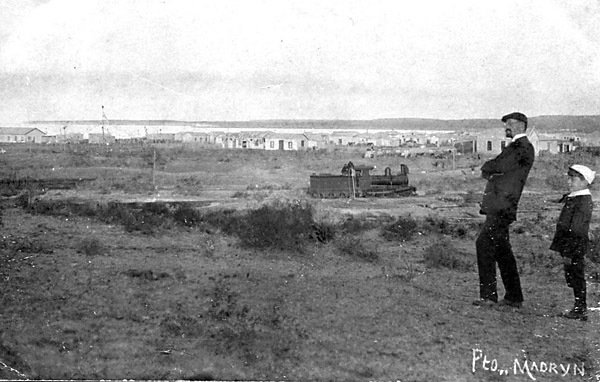 The location is unknown but the trees in the background suggest that it was in the Chubut valley. 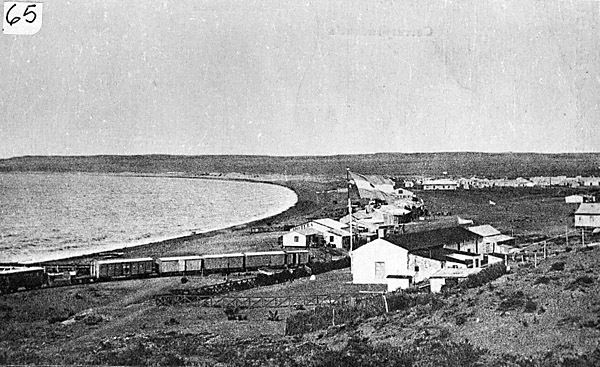 This view was found in the Province of Chubut Ministry of Education digital photographic archive. 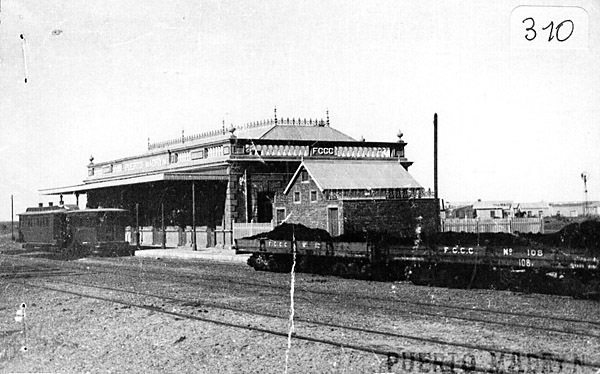 It shows Trelew station at harvest time. Carts are bringing in the bagged wheat which has been assembled in enormous piles prior to loading onto trains. Excursions out to Joseph's Tower seem to have been popular. 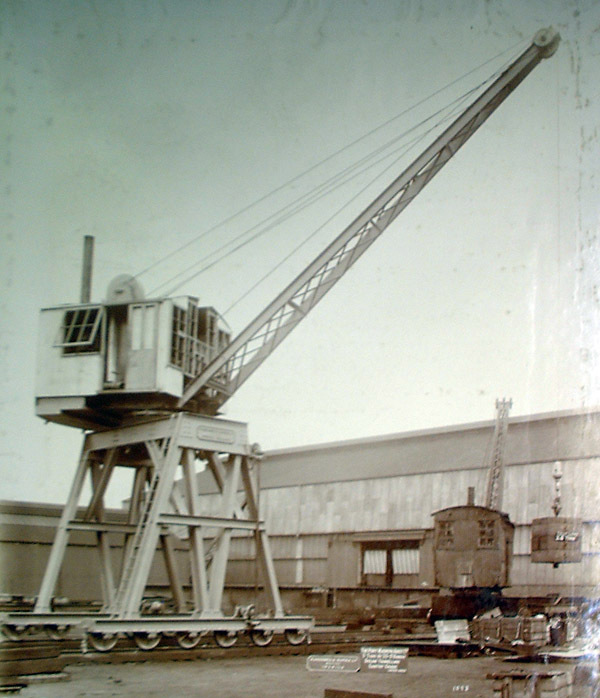 One is shown on the locomotives page and here is another. The train is hauled by one of the 2-6-0s, and consists of a four-wheeled van or furgon, five of the Bolling & Lowe coaches, and a larger coach at the rear.